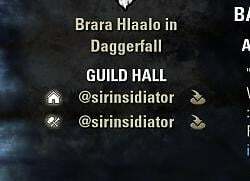 A simple addon which shows available "guild halls" on the guild home screen when installed. It looks for a special character sequence in member notes and shows the player name on the guild home menu. There are two types of markers available: "<GH" for regular guild halls and "<CW" for crafting workshops. In addition, the marker optionally allows to specify a house id right after the initial character sequence. If no id is specified, the addon will jump to the primary residence. You can use the commands "/markguildhall <guildId>" and "/markworkshop <guildId>" while inside a house to open the notes dialog of the house owner with the appropriate marker added to the end. is there a way you can make an option to choose if you want to see users account name or house name on the guild panel? Our community consists of several guilds (more than 5) with common guild hall. Unfortunately owner of the guild hall can't be a member of each guild due to game limitations. So we need possibility to add links to owners into existed guild hall list via the MoTD info (with customizable or/and presetted signature). Could you add something like this to your addon? I'll check it out. Thanks for the code! Last edited by harakira : 12/09/17 at 06:33 AM. This addon is great! Nice work! One request would be a way to give priority to a specific hall, so it remains the first listed. 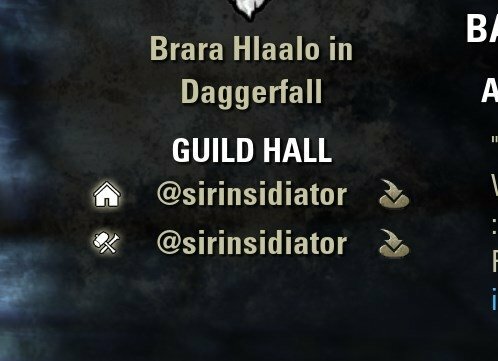 We have several houses we would like to list as guild halls, but they appear to all be in alphabetical order, putting the "official" hall of the GM near the bottom. Is it possible to have them listed by guild rank instead? or create a second tag for member notes to assign an "official" hall which will remain listed above the rest? I love this addon, I'm always searching around for my Guild Leader that has the Guild Hall and taking lots of time now all i have to do is click "g" and than the portal next to the name on the first page of Guild Info. What's even better is that you can have multiple Guild Halls on the front page as long as the member note says "<GH". It would be nice possibly to have a Guild Craft Hall option (<GCH) since I'm in a guild that's trying to have both a Guild Hall for events and a Guild Craft Hall with in the future all the attunables. This is great, but I do have a request to make it so in addition to anyone that has "<GH" in their notes, it also just automatically adds the GuildMaster (who usually has the Guild Hall anyway). Love that it lists multiple guild halls! Thanks for your idea, but "usually" unfortunately does not mean always. I know of at least one guild where the GM himself doesn't have the hall, but instead his secondary account. So I can't add this into the addon as to keep it flexible for everyone.